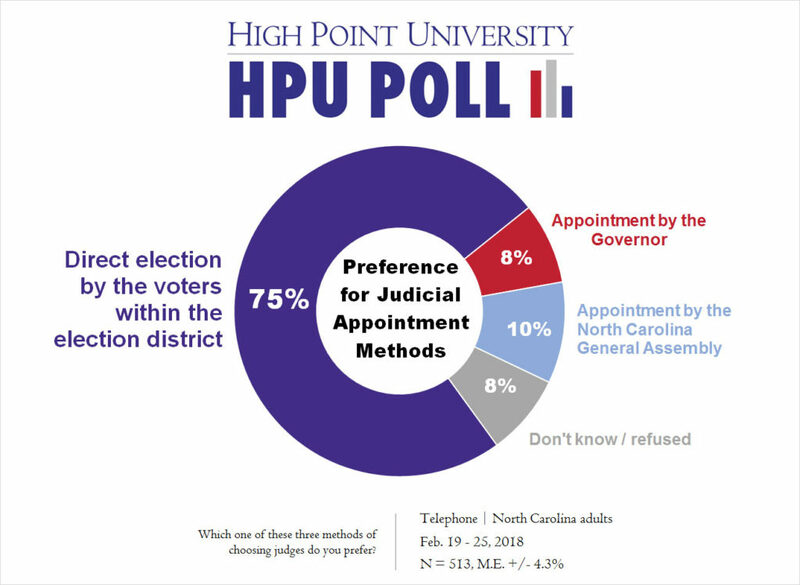 HIGH POINT, N.C., May 18, 2018 – The High Point University Survey Research Center and Department of Criminal Justice conducted a statewide poll and analysis on North Carolinians’ level of awareness and support for potential changes to the way the state appoints judges. The poll found that 49 percent of survey participants were unaware that North Carolina is considering changing the way it appoints judges from direct elections to appointment by the governor or the General Assembly. A total of 47 percent of respondents had some level of awareness, including 11 percent who said they were highly aware, 16 percent moderately aware and 20 percent slightly aware. A 75 percent majority strongly prefer to directly elect judges, while 8 percent prefer appointment by the governor and 10 percent prefer appointment by the General Assembly. The Survey Research Center conducted the poll in late February. Little and Dr. Thomas Dearden, assistant professor of criminal justice, analyzed and recently produced a preliminary report about the findings, which they plan to submit for publication. Their findings remain timely as the North Carolina General Assembly recently began a legislative session that may include discussions about the reform of judicial appointments. How aware are you that the NC state government is considering a major change in the way judges are selected to serve full terms of office? 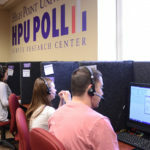 This HPU Poll was fielded by live interviewers at the High Point University Survey Research Center calling on Feb. 19-25, 2018. The responses from a sample of all North Carolina counties came from 513 adults with landline or cellular telephones. The Survey Research Center contracted with Survey Sampling International to acquire this sample. The survey has an estimated margin of sampling error of approximately 4.3 percentage points for all adult respondents. The data is weighted toward population estimates for cellular and landline telephone use, age, gender, race, and education level based on U.S. Census and CDC numbers for North Carolina. In addition to sampling error, factors such as question wording and other methodological choices in conducting survey research can introduce additional error into the findings of opinion polls. 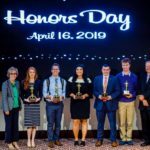 Details from this survey are available at http://www.highpoint.edu/src/files/2018/05/57memoJ.pdf.